The world doesn't really need a prequel to Alien and, to be honest, Prometheus doesn't really need to be a prequel to Alien. Ridley Scott's return to the series he began with his classic 1979 film would probably work much better as a standalone feature, but as few studios fancy financing an original science-fiction blockbuster these days, we instead have a picture aimed at awkwardly shading in gaps that are surely better left unfilled. Many fans may be breathlessly excited about Scott's explanation of the mysterious "Space Jockey" creature whose remains were glimpsed in Alien, but surely the tantalising sense of the unknown was one of the most attractive things about it? As a result, Prometheus feels like a film that doesn't really know what story it wants to tell, and it ends up saying nothing of value. Watching this picture crumble into incoherence in its second hour is an extraordinarily deflating experience, because the film begins promisingly and excitingly. Archaeologist couple Elizabeth Shaw (Noomi Rapace) and Charlie Holloway (Logan Marshall-Green) discover cave paintings in 2089 that are mirrored in numerous cave paintings and carvings unearthed across the globe. These images are read as a message or an invitation from the "engineers," an alien race understood to have created life on this planet, and so a team of scientists and mercenaries is recruited to answer their call. However, If you think Prometheus is going to be a blockbuster of ideas, a mainstream film that will dare to explore such lofty notions as the genesis of mankind and the existence of God, then let me check your excitement right now. By its second half, Prometheus has descended into an increasingly dispiriting series of gruesome encounters and chases through corridors, with all signs of intelligent life having long been lost, presumably down one of the numerous holes that litter the plot. It's hard to fully express how poor the screenplay provided by Jon Spaihts and Damon Lindelof is. Simple, straightforward characterisation is no crime in movies like this – indeed, both Scott's original film and James Cameron's Aliens succeed by giving us just enough info on the players involved – but there's an astonishing crudeness and lack of consistency in these characters. The nominal lead is Shaw, who grapples with her own faith (signified by the crucifix she wears) and who we know is unable to have children – we know this because she drops it into conversation with laughable bluntness, simultaneously setting up a later event that we can see coming from miles away. The film's characters only ever behave in the way the screenplay requires them to, even if it contradicts their nature; one minute, wimpy biologist Millburn (Rafe Spall) is running from the very idea of an alien life form, the next minute he is cooing at a snakelike creature as if it was a kitten. As various characters meet their predictably nasty deaths, none of it matters because none of them felt real in the first place. It's all a bit rough on the talented cast Scott has assembled. Michael Fassbender (the obligatory android), Charlize Theron (the icy onboard corporate presence) and Idris Elba (the devil-may-care captain) all bring a welcome sly wit and confidence to the film that partly makes up for Rapace and Marshall-Green's inability to do anything with their own characters. 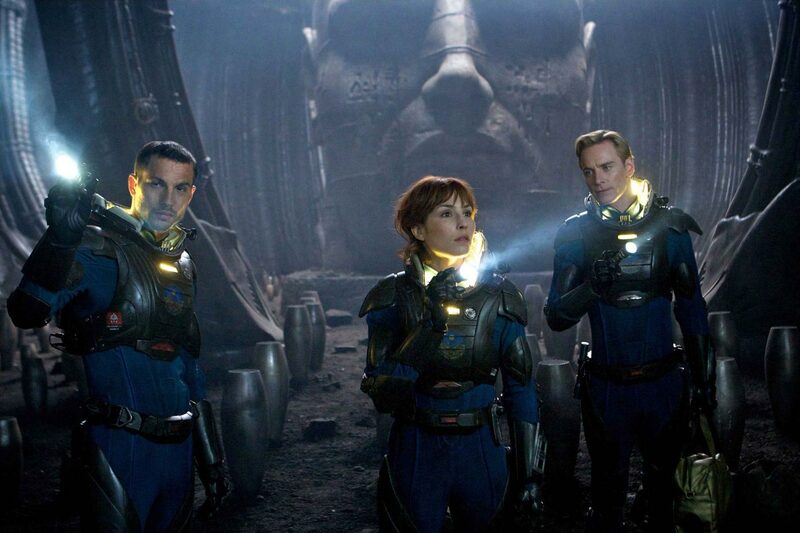 But perhaps the most striking thing about Prometheus is how rushed it all feels. The film never takes a moment to breathe, there is no attempt made to slowly build an authentic sense of tension and drama, and this couldn't feel more at odds with the picture Scott is trying to draw a link with. Alien and Aliens are wonderful slow-burn pictures, films that allows us ample time to anticipate something awful happening long before it actually does, but in Prometheus everything feels forced and unsure of itself. The blaring musical score tries to direct our emotions as the action on screen fails to do so, and while the film exists on a much bigger scale than Alien did (Scott delights in sharing the planet's imposing landscape and the undeniably fine production design) it paradoxically feels so much smaller and less significant. Ridley Scott still knows how to enthral viewers with his keen visual sense (crappy 3D aside) and he can still stage a bloody death with icky effectiveness, but he is a shallow director and he is unable to elevate a terrible script through his own storytelling skills. I'm sure many people out there will be debating Prometheus and speculatively filling in the gaps in the story, but that's something the filmmakers should have taken the care to do for themselves, and I'm not really sure it's worth the effort.